The Alfa Laval SaniJet 25 rotary jet head provides 360 degree indexed impact cleaning over a defined time period. It is automatic and provides a guaranteed means of achieving quality assurance in tank cleaning. Used in food and dairy, pharmaceutical and biotechnology industries, the device is suitable for processing, mixing and storage tanks and vessels between 4,000 and 40,000 gallons. The SaniJet 25 is particularly suitable for ultra-hygienic industries that follow European Hygienic Engineering & Design Group Guidelines. With crevice-free design, Toftejorg Rotary jet heads effectively clean tanks using less water, less energy and less cleaning agents than static spray balls. This not only helps reduce consumption of high-purity water, electricity and chemicals but boosts your company’s to environmental profile. Each device cleans with concentrated jets and 360° coverage, resulting in the highest impact and lowest liquid consumption - all within the shortest time possible. To ensure product integrity, all Toftejorg Rotary jet head devices are made of safe and non-reactive hygienic materials. All materials made of stainless steel are fully traceable in accordance EC No. 1935/2004. 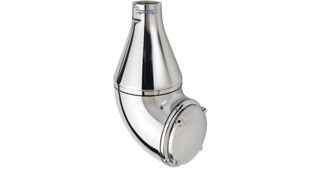 All non-metallic parts used comply with FDA requirements 21CFR § 174; non-metallic parts of rotary jet heads used for the Biopharm applications are certified in accordance with USP Class VI regulations. Upon request, 3.1 certificates can be supplied for those tank cleaning devices that meet the EN10204 standard. The Rotary jet head is also EHEDG certified. All equipment and components in the Alfa Laval BioPharm portfolio are supplied with Alfa Laval Q-doc, a comprehensive documentation package that provides full transparency of sourcing, production and supply chains as well as full traceability of all changes in material, manufacturing procedures or spare parts. This smoothes process validation by providing factual support to substantiate GDP (Good Documentation Practice) for every aspect of BioPharm equipment supply and provides customers with high-quality Alfa Laval products backed by a no-risk guarantee. The Q-doc package includes equipment manuals, product/performance test, quality and manufacturing procedures, relevant material certificates, traceability documentation, and the necessary parts and service information.This attention to detail maximizes uptime and minimizes risk.